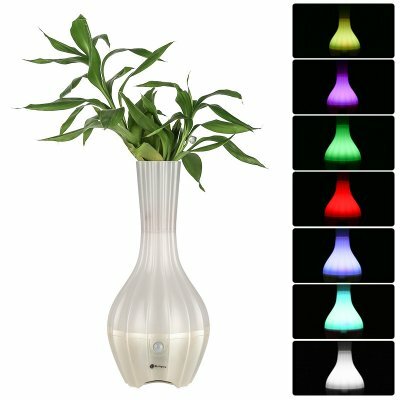 Successfully Added Bluetooth Speaker Vase - Bluetooth 4.0, 1400mAh, RGB LED Light, Motion Detection, 70dB, 10m Bluetooth Range, Microphone to your Shopping Cart. This remarkable gadget is so much more than your ordinary decorative flower vase. This beautiful vase features an intergraded LED light as well as Bluetooth speaker. Thanks to this, it lets you light up your room in your favorite color and allows you to listen to your favorite tracks. With its RGB LED, this Bluetooth speaker vase allows you to put forth a smooth colorful light to match your interior. Additionally, it also can create a bright white light that lets you use this Bluetooth speaker as a regular desk light. With its stylish design, this Bluetooth speaker vase is a sweet gizmo that looks great in any modern household. By supporting Bluetooth 4.0, this Bluetooth speaker can be easily paired with your smartphone or tablet. Once done so, it allows you to listen to your favorite tracks straight from your mobile music library. Additionally, your vase comes with a built-in microphone that allows you to engage in hands-free phone calls. With a 10 meter Bluetooth range, you’ll be free to move through the room without interrupting your Bluetooth signal. The speaker itself sets forth 70dB of sound which is enough to fully enjoy any of the songs stored on your smartphone. With its motion detection sensor, this LED light can be programmed to turn on automatically whenever movement is detected. This makes it a great nightlight that can be used to light up your hallway at night. The sensor features a 110-degree angle and 3-meter range, making it great for any small and medium sized room out there. With its 1400mah battery, this LED Bluetooth speaker vase lets you enjoy countless hours of standby time and 4 hours continuous usage time. This Bluetooth speaker comes with a 12 months warranty, brought to you by the leader in electronic devices as well as wholesale electronic gadgets..